Instagram has over 300 million monthly active users, and the current roll-out of Instgarm ads within the Facebook self-service ads interface, means that Instagram ads are now kind of a big deal for brands at the moment. 70% of users have looked for a brand on Instagram, so what are you waiting for? What can Instagram ads be used for? Currently Instagram ads are widely available for generating clicks to your website, video views and app installs. You can also use them for ‘mass awareness’ which is designed for wide reaching campaigns that focus on generating views of your content, however this type of buy needs to be done via your Facebook rep as an insertion order. 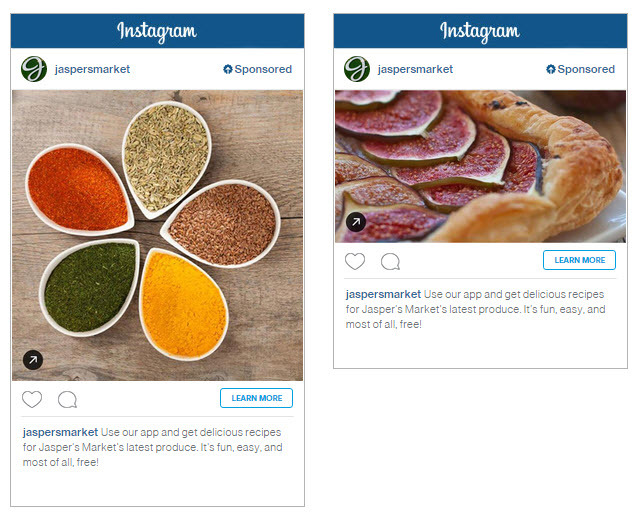 What results will you see from Instagram ads? My experience of Instagram ads so far has shown they work best as a way of generating assisted conversions, brand awareness or engagement. They haven’t worked well for trying to generate direct (last click) conversions with ‘hard sell’ messages and messages that are too product focused. This doesn’t mean they don’t boost your bottom line though, as their role in assisting conversions has seen some brands experience seriously significant sales uplift. For example Facebook Instagram reported that the furniture retailer Made.com achieved a 10% increase in order values after its Instagram campaign. Kenshoo suggest that users are two and a half times more likely to click on ads in Instagram than other social media platforms, and Nielson reported that across more than 475 beta campaigns, ad recall from sponsored posts on Instagram was 2.9 times higher than normal levels of recall for online advertising. What are the targeting options for Instagram ads? Instagram ads are set up in the Facebook ads interface (or Power Editor and Facebook ads API), so you can use all the same targeting you have available in Facebook ads for your Instagram ads! The targeting is based on what Facebook know about users based on their activity on Facebook, Instagram, third party apps and websites. Currently there are no targeting options specific to Instagram. For example you can’t yet target people who already follow your brand on Instagram, like you can target existing page fans in Facebook. This seems like a big oversight in the targeting functionality, so I’d imagine it’s something that’ll be released soon. Although you can use all the same audience targeting that is available on Facebook for Instagram ads, the platform has a slightly different user base, so the opportunities for reach in some target audiences are different. For example you wouldn’t want to use Instagram to target older audiences (50+ year old), whereas Facebook actually has a significant level of users who are 50+. 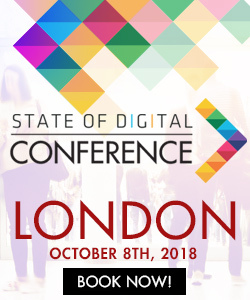 Are there any targeting strategies that work particularly well on Instagram? Instagram users are quite rightly getting a bit annoyed with all the adverts that are appearing on the platform recently now the platform is open to all advertisers. The main reason I’ve heard Instagram users say they don’t like the ads is because “they aren’t even relevant”. I don’t think this is a sign that the ads platform or targeting is bad, I think it’s a sign that advertisers aren’t being strategic enough with their targeting! Make sure you target your ads strategically so you’re not that annoying users. My advice is to start with audiences that you already have a relationship with (such as existing Facebook page fans, or custom audiences). This is where the biggest success has been seen so far in my experience, possibly because users are more open to seeing your ads when they already have a relationship with you. When you go broad-brush with your targeting and lose the relevancy, you’ll start to get poor engagement and CTR which is going to damage your Relevance Score and see you paying more for clicks / views / installs. Custom audience strategies have been really successful on Instagram in my experience, although you may find this varies depending on the size of your custom audience and how many of them are active on Instagram. For some strategy ideas for custom audiences check out this 15 Ways to Use Facebook Custom Audiences post and this presentation on Facebook Custom Audiences. When you do branch out to new users, make sure you stay super relevant. Try 1% lookalike audiences of your existing page fans for example, and then build out slowly from there. As Instagram users become more comfortable with ads appearing on their platform I think you’ll see wider audience targeting working slightly better, but for your initial tests I’d start with your existing audiences and then gradually widen. 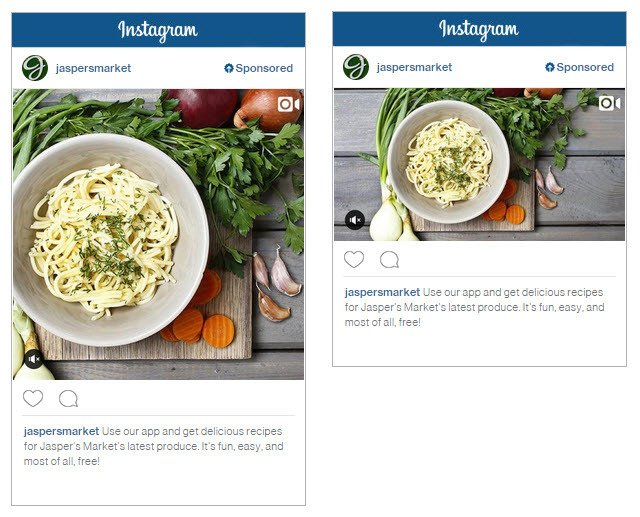 What kind of content works well in Instagram ads? If you want to get good results, you must be prepared to create bespoke content for Instagram, and not just re-use your Facebook ad images or display ad images. People are on Instagram to browse images and get inspiration, so your ad content needs to fulfill these needs! Avoid content that is too product focussed, such as boring traditional products shots. If you must promote your products use nice lifestyle shots where the products just happen to be in the image. I’d give the same advice for video content, so try lifestyle videos and tread carefully with product focused videos like product demonstrations. Why not try some storytelling if you’re using the carousel ad format? 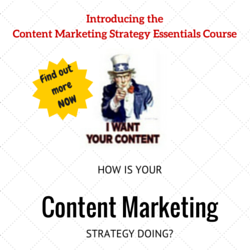 You could also incorporate sequential advertising tactics into your messaging. 48% of users say they follow brands on Instagram because they find the brand content funny or interesting, so if your ads are also interesting to the audience you’re targeting you are more likely to see positive results. 54% say they follow brands to discover new things, so another good content angle is to create ads that are innovative or promote new and exciting things. Try using your top performing organic Instagram posts as an indication for what might work as ads. Unfortunately you can’t choose to promote an existing post in Instagram ads like you can on Facebook, so you’ll need to re-create the post in ads manager (or Power Editor) in order to run it as an ad. Don’t forget that all photos you use on Instagram ads must be commercially licensed and legally cleared. What budgets do you need for Instagram ads? This completely depends on the audience you’re targeting and how many of them you’d like to reach! There’s no minimum spend limit, so you could try testing with a small budget and work your way up once you’ve seen results. In the ads interface you can see an estimated audience size, and as you adjust your budget you’ll see the number of people you can reach per day changes based on how much you plan to spend. If your potential total audience size is really small, you’ll need less budget to reach most of that audience. If you put in your budget and the estimated daily reach is 100 percent then you might want to keep an eye on your frequency because it might be that you’re hitting users with your ads too often and becoming annoying. In some cases where the audience is particularly niche it takes longer to spend through your budget so be prepared to run those type of campaigns over at least a few days. This is because not every user in your audience is going to log on every day, so you need to run ads for a few days to reach them at different times. 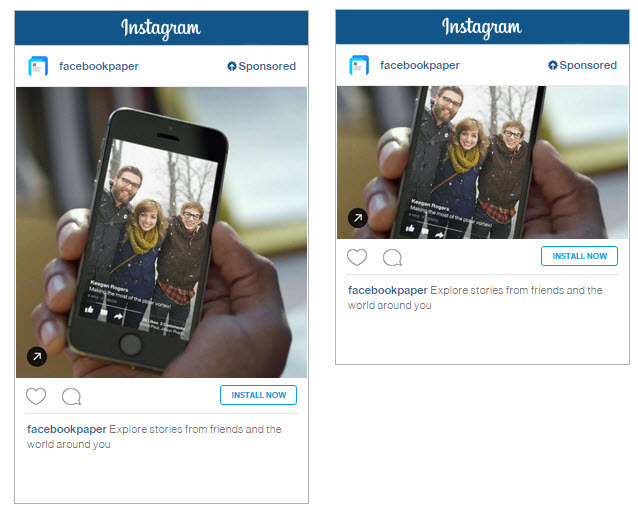 What ad formats are available for Instagram ads? My experience so far has shown that square ads have generated a better CTR (maybe because they look more native to the platform), although I’d recommend testing both ad formats and seeing which works best for your brand. You can find via the following link, an Instagram guide to all ad sizes and specs for video, website clicks, and app installs. Just click into each ad objective (clicks to website, video views, or app installs) and choose the Instagram option. Your ads can include five different call-to-action buttons, however these seem to perform differently on Instagram than they do on Facebook. For example in my experience the ‘Shop now’ button actually saw my CTR decrease compared to the same ad without the ‘Shop now’ CTA button. Test these different CTAs against each other and against ads with no CTA buttons and see which ones perform best for your brand. It’s essential to set up conversion tracking for your ads so you can see the impact it’s having on your results. You can use the same conversion tracking that’s already set up in your Facebook ad account. If you haven’t already got conversion tracking set-up in your Facebook ad account you can learn how to do this here. If you’re an ecommerce site it’s well worth taking the extra time to customise the pixel to dynamically pull in the value of your conversions, so you can really review your return on ad spend. You should also use Google Analytics UTM tracking (or your analytics software’s equivalent) on all your ads so that you can track them in Google Analytics. It’s important to use both Facebook’s own conversion tracking pixel even if you review your performance in Google Analytics using goals or events, because not all Facebook ads and Instagram ads traffic are tracked correctly in Google Analytics even when you use UTM tagging. This happens for a variety of reasons such as app traffic not being able to be tracked. You can find out more about it here here. Instagram ads use the same bidding system as Facebook ads and so they are subject to the same Relevance Score factors. You can learn more about Relevance Score here. The first thing you should do is add your Instagram account to your Facebook page or Business Manager account. To add your Instagram account to Business Manager use these instructions. If you don’t have business manager you can add your Instagram account to your page using these instructions. I’d recommend using Power Editor to create your Instagram ads so you get access to all the best targeting and are able to scale your ad sets and campaigns easily with copy and paste functionalities. Create a new ad campaign in the same way you normally would for Facebook ads in Power Editor (instructions here), and choose either website clicks, video views, or app installs as your advertising objective. If you want to use Instagram ads for more than one of these objectives you just need to create a new campaign for each objective type. Next create your ad set within the campaign, also in the same way you usually would for creating Facebook ads. Set your targeting, budgets and scheduling in the same way you normally would for a Facebook ads campaign. Although you have the option to run the same ads in both Instagram and Facebook, I’d recommend against this because the best Instagram ads campaigns are the ones which have completely unique content and strategies that have been designed for the platform, rather than recycling or duplicating your Facebook content. By keeping your Facebook ads and Instagram ads in separate campaigns (or at least separate ad sets) you’re also easily able to review their performance separately, which is important as ads perform differently on each platform. 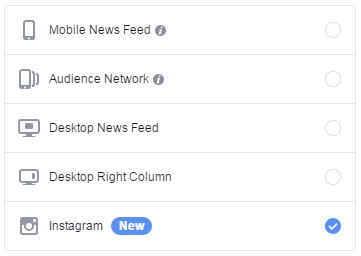 Next go to the ads tab, where you’ll see the ad format looks a little bit different to normal Facebook ads, but all the same components are there. Upload your image or video as usual, along with your destination URL (and UTM tracking). For square Instagram ads you can find the full spec here and the images should be 1080 by 1080 pixels in size. The same restriction of ensuring your image is no more than 20% text apply as normal. There’s just a single text box, rather than a description box like you normally get on Facebook ads, and Facebook recommend 125 characters is the optimum length (although you can write more or less than this). I’d recommend creating a few ad variations to allow Facebook to pick the top performers for you. Now you just need to upload the changes as you normally would! You receive all the same data on your Instagram ads in the Facebook reporting interface that you would normally receive for Facebook ads so you can keep an eye on their performance and optimise based on this. Instagram ads are only going to continue to grow in popularity, so take advantage of them being new and having lower advertiser competition at the moment, which means Cost Per Clicks are still relatively low. What have your experiences with Instagram ads been like? Share your tips or strategies in the comments below! Tara, thanks for such detailed information. Instagram is a good way of marketing nowadays, and you even gave us statistics about its audience. Great job! Cracking stuff Tara, bookmarked and shared. Hi ,can we use the facebook power api manager to create the instgram ad and target it using instagram id ?